Many of these diseases are silent diseases, meaning you cannot rely on symptoms to alert you to an infection because they typically do not cause any. Undetected infections may lead to serious, complications if left untreated. Luckily, most are curable with an easy treatment plan. Consider getting your screening today at one of our STD Testing UT locations. Knowing your status is the most important thing you can do for your sexual health. It allows you to prevent the spread of infections to your partner and protect your health from complications. Get checked today at an STD Testing Utah location and find your peace of mind. Untreated infections can lead to many health complications, including infertility and Pelvic Inflammatory Disease. Visit one of our screening STD testing Utah centers today and get privately checked. We are thrilled to offer 15 laboratories in STD Testing UT for the convenience of our patients. No appointments are required for your Utah STD testing lab visit. Show up whenever to the STD Testing UT center with your lab order whenever you are available. Get your results in as little as three business days. If they are positive, our clinical team will answer questions, explain your results, and when appropriate, prescribe treatment. With 15 STD testing Utah testing locations, it is never been more convenient and easy to get screened. 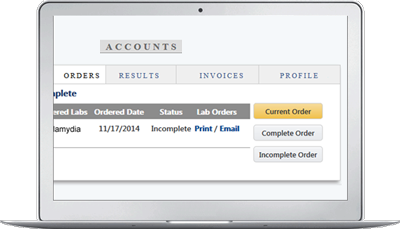 Simply place your order and visit a lab to submit a blood and/or urine sample. It only takes 15 minutes and your results will be back in as little as three days. We will never share your information without your consent. The staff here strictly adheres to all federal and state privacy regulations, including HIPAA. Our laboratories are all FDA approved and/or CLIA certified, providing you with professional and quality care. Highly regarded as top tier STD testing Utah lab locations centers so you can rely on receiving unmatched service at our STD testing Utah locations. Choose us for your screening needs and get checked for STD testing today.